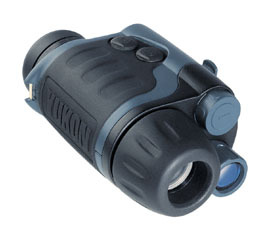 Yukon NV MT1 is proud to introduce the newest addition to our premium night vision line. The NV MT1 embraces the most modern, cutting edge technology available without forgetting practicality. A key component to the originality of the new NV MT1 is that it sheds the burden of a one-dimensional item and evolves into a multi-functional system allowing the scope to be used virtually anywhere. Whether you choose to take advantage of the optional waterproof version or stay with our standard variety; you will be simply amazed by the ease of use and quality of image provided by this compact unit. The NV MT1 is equipped with two 1/4 inch mounts thus it can be utilized for a head mount as well as a riflescope. As an option, the NV MT1 can also be coupled with an exclusive rifle mount/laser system elevating the NV MT right to the top of the newest generation of compact night vision riflescopes. The NV MT's newly developed lenses have improved wavelength / contrast characteristics which help to utilize every bit of light ampflification from the night vision tube. This unique design allows the scope to produce a clear image with quality and high resolution. The NV MT1 was primarily designed to produce a quality image. The unit design has also considered both comfort and ease of use. The NV MT1 is equipped with comfortable sensor control buttons coupled with an ergonomically designed body and innovative lens cover. Rugged rubber armor protects the NV MT from destructive moisture and other elements. Our Exclusive PULSTM system provides the highest level of infrared illumination without the significant power drain on the battery. The PLUSTM system allows the maximum possible output by the I.R. Illuminator doide, yet letting it rest between the impulses to protect the IR from burning out. The pulsing frequency is invisible to a human eye but it penetrates longer distances due the quick energy bursts of the IR. * Optional waterproof version provides complete damage protection from water. Waterproof unit is 100% effective and operational under water at depths up to 3 feet for a 24-hour period. 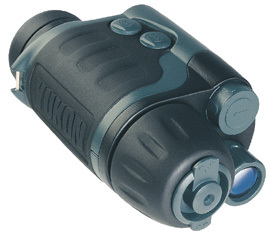 Yukon NV MT1 WP is proud to introduce the newest addition to our premium night vision line. The NV MT1 WP embraces the most modern, cutting edge technology available without forgetting practicality. A key component to the originality of the new NV MT1 WP is that it sheds the burden of a one-dimensional item and evolves into a multi-functional system allowing the scope to be used virtually anywhere. Whether you choose to take advantage of the optional waterproof version or stay with our standard variety; you will be simply amazed by the ease of use and quality of image provided by this compact unit. The NV MT1 WP is equipped with two 1/4 inch mounts thus it can be utilized for a head mount as well as a riflescope. As an option, the NV MT1 WP can also be coupled with an exclusive rifle mount/laser system elevating the NV MT1 WP right to the top of the newest generation of compact night vision riflescopes. This unique design allows the scope to produce a clear image with quality and high resolution. The NV MT1 WP was primarily designed to produce a quality image. The unit design has also considered both comfort and ease of use. The NV MT1 WP is equipped with comfortable sensor control buttons coupled with an ergonomically designed body and innovative lens cover. Rugged rubber armor protects the NV MT from destructive moisture and other elements. 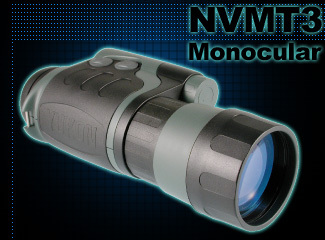 Yukon NV MT2 is proud to introduce the newest addition to our premium night vision line. The NV MT2 embraces the most modern, cutting edge technology available without forgetting practicality. A key component to the originality of the new NV MT2 is that it sheds the burden of a one-dimensional item and evolves into a multi-functional system allowing the scope to be used virtually anywhere. Whether you choose to take advantage of the optional waterproof version or stay with our standard variety; you will be simply amazed by the ease of use and quality of image provided by this compact unit. The NV MT2 is equipped with two 1/4 inch mounts thus it can be utilized for a head mount as well as a riflescope. As an option, the NV MT2 can also be coupled with an exclusive rifle mount/laser system elevating the NV MT2 right to the top of the newest generation of compact night vision riflescopes. This unique design allows the scope to produce a clear image with quality and high resolution. The NV MT2 was primarily designed to produce a quality image. The unit design has also considered both comfort and ease of use. The NV MT2 is equipped with comfortable sensor control buttons coupled with an ergonomically designed body and innovative lens cover. Rugged rubber armor protects the NV MT2 from destructive moisture and other elements. 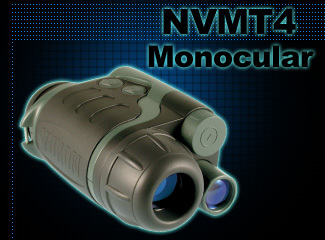 Yukon NV MT2 WP is proud to introduce the newest addition to our premium night vision line. The NV MT2 WP embraces the most modern, cutting edge technology available without forgetting practicality. A key component to the originality of the new NV MT2 WP is that it sheds the burden of a one-dimensional item and evolves into a multi-functional system allowing the scope to be used virtually anywhere. Whether you choose to take advantage of the optional waterproof version or stay with our standard variety; you will be simply amazed by the ease of use and quality of image provided by this compact unit. The NV MT2 WP is equipped with two 1/4 inch mounts thus it can be utilized for a head mount as well as a riflescope. As an option, the NV MT2 WP can also be coupled with an exclusive rifle mount/laser system elevating the NV MT2 WP right to the top of the newest generation of compact night vision riflescopes. This unique design allows the scope to produce a clear image with quality and high resolution. The NV MT2 WP was primarily designed to produce a quality image. The unit design has also considered both comfort and ease of use. The NV MT2 WP is equipped with comfortable sensor control buttons coupled with an ergonomically designed body and innovative lens cover. Rugged rubber armor protects the NV MT from destructive moisture and other elements. The NVMT (Night Vision Multi Task) is probably the most ergonomically designed, aesthetically pleasing, well featured and highest performing Gen 1 night vision monocular available on the market today. Ultra-compact, lightweight, easy to use and comfortable to hold, the new NVMT is unique for a budget night scope in offering a tactile, suregrip plastic bodyshell and, for extra protection/grip, partial rubber armouring. Featuring a high grade Gen 1 Image Intensifier Tube (IIT), the NVMT has a built-in, powerful Infrared (IR) Illuminator for use in very low light/total darkness. Power for the scope and IR is provided by 1 x 3V Lithium CR123A battery (not supplied). A green LED next to the viewfinder indicates when the Image Intensifier Tube is switched on while a red LED indicates when the IR Illuminator is switched on. A tripod socket is built-in as standard. The NVMT3 is slightly larger and heavier than the NVMT2. 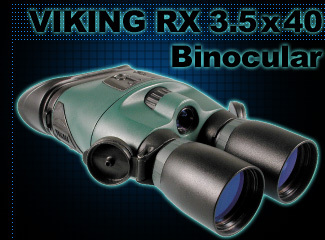 It offers 4.0x image magnification and a 15° field of view. The NVMT4 is the smallest and lightest of the NVMT variants. 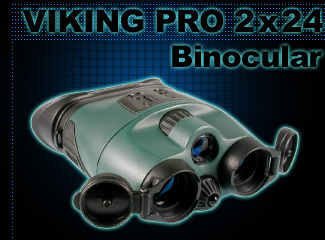 It offers 1.0x image magnification and a wide 30° field of view. A belt mountable case is included with all NVMT models. 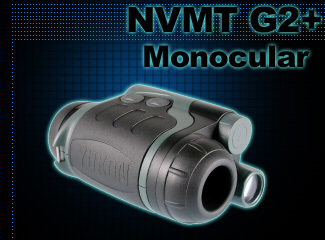 Currently the top of the range model, the NVMT G2+ features a 'commercial' grade* Gen 2+ Image Intensifier Tube (IIT). The NVMT has a built-in, powerful Infrared (IR) Illuminator for use in very low light/total darkness. Power for the scope and IR is provided by 1 x 3V Lithium CR123A battery (not supplied). A green LED next to the viewfinder indicates when the Image Intensifier Tube is switched on while a red LED indicates when the IR Illuminator is switched on. 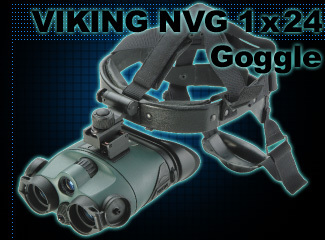 The NVMT G2+ is a very compact and lightweight Gen 2+ night vision monocular. It offers 2.0x image magnification and a very comfortable, long eye relief eyepiece with a wide 30° field of view. NVB Viking night vision binoculars incorporate eyepieces that provide accurate viewing and avoid detection.